The sun rises slowly behind the gently swaying grasses. Groggy bees weave through the thicket, seeking the very best flower. A heron soars overhead, looking for the perfect spot to go fishing. Songbirds perch nearby, singing songs of love to the limpid sky. A sense of peace permeates the scene. All is right with the world, all creatures, great and small, have their place. This is the magic of the Eastern Shore. Tired of the hustle and bustle of city life and longing for a glimpse of nature, people drive hours to enjoy the gentle rhythms of nature on the shore. If only we could enjoy it with our first cup of coffee, every day. Starting with a yard plan by Chris Pax, whom the Reedys met at Adkins Arboretum, the Reedys began taking out the “same old, same old” plants that had been the only growing things outside of token trees and a lawn and replaced them with native species plants to bring back birds and pollinators, even removing an unfixable old pool that might once have been wonderful but wasn’t anymore. 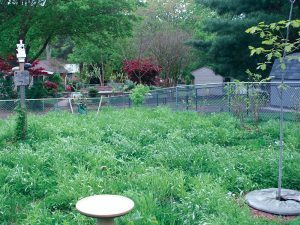 Instead of more lawn to be mowed, the Reedys opted to replace it with a meadow, with native species grasses and wildflowers. It’s now a much-loved home for birds, bees, and butterflies. A yard transformed…instead of an “everyplace” lawn with token foundation shrubs, their yard is alive with visitors of the wild variety. The neighbors love it, too. The Reedy’s urban meadow brings wildlife back to this neighborhood. 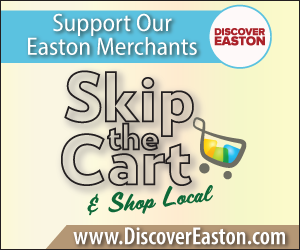 The magic of the Eastern Shore, with a cup of coffee, right in the heart of Easton on a moderate, 1/3 acre lot, a block from the high school. “Wilding” the suburban lot was once an oddity, but nowadays it’s the done thing, not only by Bay lovers but the many who want to improve the environment, starting at home. People, she notes, are more and more interested in a natural setting for their homes, and most really enjoy helping the Bay. All of them love fewer yard chores – and – best of all – it’s free. “There are so many things that any homeowner can do that will help the Bay and improve their property values,” she says. In fact, the Master Gardeners have a whole program designed to do just that – help homeowners create the wonderful Bay-friendly yard of their dreams. If you see a Bay-Wise sign – that’s what’s going on. 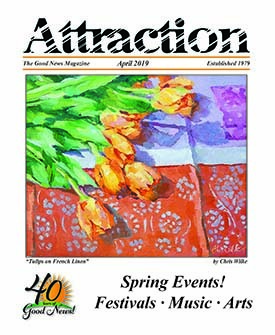 The homeowners have contacted the Master Gardeners, completed the yardstick and are living the good life knowing their yard reflects their ideals and helps maintain the magic of the Eastern Shore. Like the Reedys, who earned the Bay-Wise sign the first time the Master Gardeners saw their property. It’s hard to be more Bay friendly! “It can actually help with property values,” Mikaela comments, “we had a group of realtors that contacted us to find out what Bay-friendly practices are so they can discuss it with their clients.” Even those not on the Eastern Shore can benefit from utilizing these practices at home. “Every place is in a watershed,” Mikaela notes, so, while this program is to save the Bay, no matter where you are, you can help the environment by practicing these measures. The Bay-Wise yardstick is full of possibilities for homeowners. Rain barrels. Self-mulching areas (leave the pine needles or leaves in place), plant native species plants, install rain gardens, and – easiest of all – stop fertilizing your lawn. Lisa acted on faith – this is good for the Bay, this is good enough – and has found that her faith was rewarded. 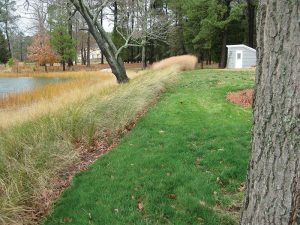 The Ghezzis installed a living shoreline – now the only legal option for waterside homeowners interested in preventing erosion – and has found that the native grasses have made their yard a peaceful oasis. Leave it to Mother Nature…and Bay-Wise. Bay-Wise is a Master Gardener program started by the state in 1996; the goal is to help homeowners learn about Bay friendly practices. Master Gardeners are trained by the University of Maryland Extension, which is found in every county. Interested homeowners contact the Master Gardener Coordinator in the Extension Office to set up a Bay-Wise visit. By appointment, Master Gardeners visit the home, tour the yard, and discuss issues the homeowner might be experiencing and suggest various solutions that will help the homeowner – and the Bay. In Talbot County, homeowners frequently are interested in planting for more birds and butterflies, rain gardens, storm water management, growing herbs and vegetables, and what to plant in wet or dry areas. Many are hopeful of magic plants that will repel deer (many plants are deer resistant. But hungry deer are willing to eat even the worst tasting things, so there’s no guarantees). The Ghezzis installed a living shoreline and have found that the native grasses have made their yard a peaceful oasis.